In this section we are going to be looking at non-linear systems of equations. A non-linear system of equations is a system in which at least one of the variables has an exponent other than 1 and/or there is a product of variables in one of the equations. To solve these systems we will use either the substitution method or elimination method that we first looked at when we solved systems of linear equations. The main difference is that we may end up getting complex solutions in addition to real solutions. Just as we saw in solving systems of two equations the real solutions will represent the coordinates of the points where the graphs of the two functions intersect. In linear systems we had the choice of using either method on any given system. With non-linear systems that will not always be the case. In the first equation both of the variables are squared and in the second equation both of the variables are to the first power. In other words, there is no way that we can use elimination here and so we are must use substitution. Luckily that isn’t too bad to do for this system since we can easily solve the second equation for \(y\) and substitute this into the first equation. This is a quadratic equation that we can solve. So, we have two values of \(x\). Now, we need to determine the values of \(y\) and we are going to have to be careful to not make a common mistake here. We determine the values of \(y\) by plugging \(x\) into our substitution. So, we have two solutions. Now, as noted at the start of this section these two solutions will represent the points of intersection of these two curves. Since the first equation is a circle and the second equation is a line have two intersection points is definitely possible. Here is a sketch of the two equations as a verification of this. 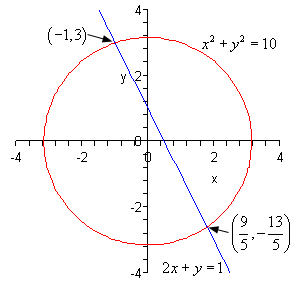 Note that when the two equations are a line and a circle as in the previous example we know that we will have at most two real solutions since it is only possible for a line to intersect a circle zero, one, or two times. 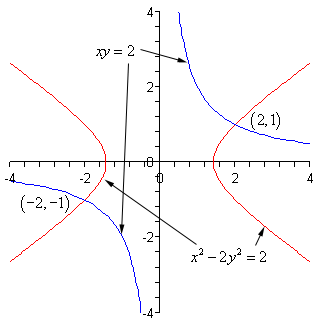 Okay, in this case we have a hyperbola (the first equation, although it isn’t in standard form) and a rational function (the second equation if we solved for \(y\)). As with the first example we can’t use elimination on this system so we will have to use substitution. The best way is to solve the second equation for either \(x\) or \(y\). Either one will give us pretty much the same work so we’ll solve for \(y\) since that is probably the one that will make the equation look more like those that we’ve looked at in the past. In other words, the new equation will be in terms of \(x\) and that is the variable that we are used to seeing in equations. The first step towards solving this equation will be to multiply the whole thing by x2 to clear out the denominators. So, we have four possible values of \(x\) and two of them are complex. To determine the values of \(y\) we can plug these into our substitution. Two of the solutions are real and so represent intersection points of the graphs of these two equations. The other two are complex solutions and while solutions will not represent intersection points of the curves. For reference purposes, here is a sketch of the two curves. Note that there are only two intersection points of these two graphs as suggested by the two real solutions. Complex solutions never represent intersections of two curves. 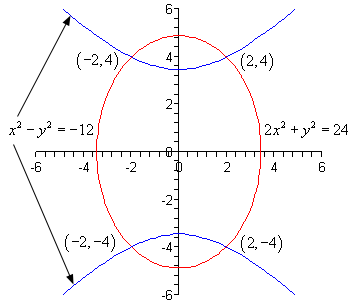 This time we have an ellipse and a hyperbola. Neither one are in standard form however. In the first two examples we’ve used the substitution method to solve the system and we can use that here as well. Let’s notice however, that if we just add the two equations we will eliminate the \(y\)’s from the system so we’ll do it that way. This is easy enough to solve for \(x\). To determine the value(s) of the \(y\)’s we can substitute these into either of the equations. We will use the first since there won’t be any minus signs to worry about. This also means that there should be four intersection points to the two curves. Here is a sketch for verification.